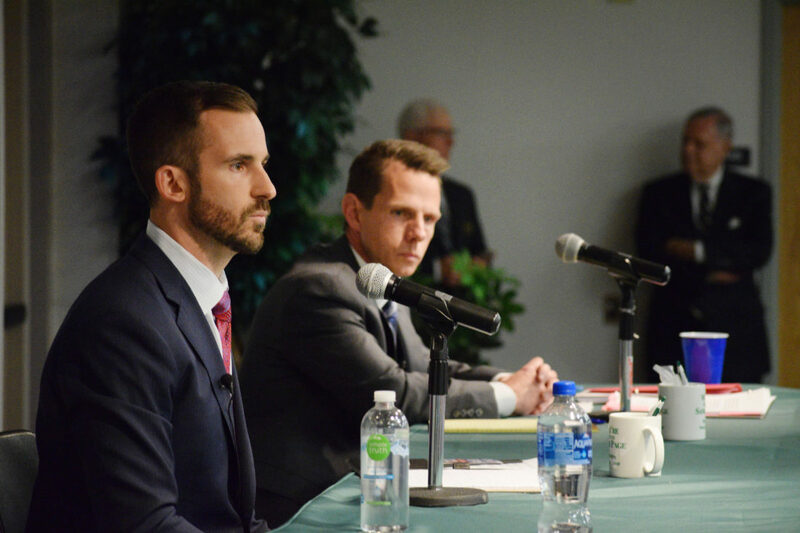 Photo by Scott McCloskey West Virginia Senate Majority Leader Ryan Ferns, R-Ohio, left, and challenger William Ihlenfeld, candidates for the state’s 1st District Senate seat, participate Wednesday in a debate at West Virginia Northern Community College in Wheeling. WHEELING — Former U.S. Attorney William Ihlenfeld said a teenage secret weapon and a “small army of volunteers” helped him win the West Virginia Senate 1st District seat in Tuesday’s general election. Ihlenfeld, a Democrat, defeated Senate Majority Leader Ryan Ferns, R-Ohio. With 96 percent of the vote counted Tuesday night, unofficial results show Ihlenfeld garnering16,867 votes in the district; and Ferns, 14,857. The 1st District includes Hancock, Brooke and Ohio counties, and a part of Marshall County. Following his election, Ihlenfeld greeted supporters at the Ohio County Democrat Party headquarters in Wheeling. That energy and momentum following two debates last month with Ferns, he explained. “It was not just for me, but for other (Democrat) candidates here,” Ihlenfeld said. The West Virginia teacher’s strike last spring propelled animosity between the teachers and GOP leaders in the State Legislature, including Ferns. No candidate initially filed to run against Ferns, but Ihlenfeld was recruited by Democrats and added to the ballot in February after the filing deadline. He credited his family, the teachers and organized labor for leading him to victory. “It’s safe to say we knocked on thousands of doors, and I couldn’t have done that myself,” he said. Ihlenfeld especially commended the campaign skills of his 15-year-old son Charlie, whom he called the “MVP” or most valuable player in his campaign. He said Charlie often accompanied him as he went door-to-door, and was a big hit with voters. Ihlenfeld is presently in private practice with the Bailey-Glasser Law Firm in Wheeling, but served as U.S. Attorney for the Northern District of West Virginia under from 2010 until 2016. He is a graduate of Ohio University, and the West Virginia University College of Law. Ferns has served as Senate Majority Leader since the start of the current legislative term in 2017. He was first elected to House of Delegates in 2010, then re-elected in 2012. In 2014, he was elected to the Senate. Ferns did not immediately respond to requests for comment Tuesday night.